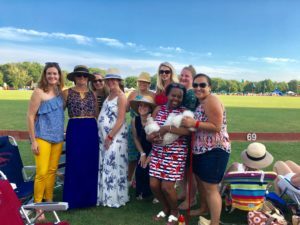 Picnic & Ponies Charity Day Tailgate - The Junior League of Boston, Inc.
Join us for our annual July fundraising event and social get-together at Newport Polo's All-Charity Day! Each year, we join forces with the Junior League of Rhode Island to kick off the summer with our Picnic and Ponies Charity Tailgate Day. This fun afternoon features a classic 6-chukker match, a half-time dog parade and festive socializing as we share tents with our friends from the Junior League of Rhode Island. All proceeds from ticket sales for this event benefit the Junior League of Boston's community programs. This is one of our most popular and fun events! Tickets MUST be purchased in advance. Light refreshments will be served; attendees are welcome to bring their own treats and drinks. Kids and dogs are welcome, children under 15 have free entry. Tickets will go on sale approximately two months before the event.